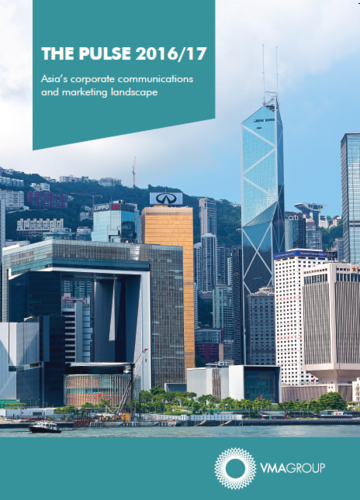 In its fourth year, and with input from over 300 communication professionals across Asia, The Pulse is the most comprehensive tool currently available for benchmarking the function, structure and future of corporate communications departments across Asia. This year, practitioners across the region told us that the last 12 months have brought mixed fortunes. Despite economic growth continuing to provide business opportunities, the looming Chinese slowdown is causing communications resourcing growth to be pre-emptively put on ice. Digital tools are giving communications teams energy and a fresh licence to operate; they are also bringing complexity to team structure and resourcing. In the midst of it all, many wondered if – a few years down the line – the corporate communications function would still exist in quite the same format as today. This latest piece of research is a must read for every communications professional working in Asia-Pacific. To find out more about our Pulse report, please contact us at marketing@vmagroup.com.